It's Finally Finished -Thanks Be To God !! Aren't they just gorgeous !! I am going to have to get busy !!!!! You can find her beautiful blog here. No stitching/ Give Thanks !!!!!! There are moments in each of our lives when we are reminded about those things which are truly the most important. 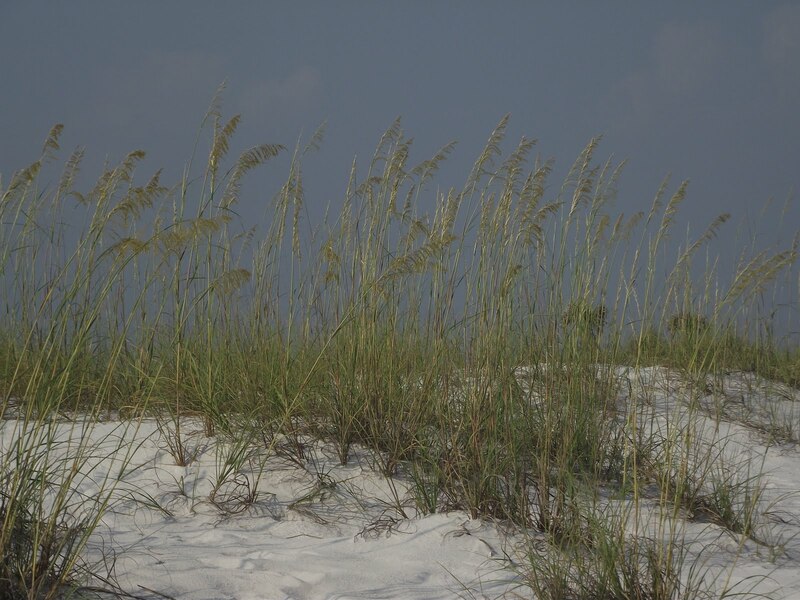 I have had 8 hours to reflect on the things that are most important to me - And, although I love stitching, & I so enjoy gardening - I find that in the truest sense it is the people in my life that I adore the most. It is my wonderful husband & my 4 children that bring me the greatest pleasure - It is my friends & family that bring me the greatest joy. It is with these precious people that I should always focus my greatest love and admiration - And it is with them that I should focus my greatest attention. When the budget is too tight, or the floor needs mopping, dinner needs cooking, or the dogs need bathing. It was then that I was reminded of how very much i loved him & how very precious are the moments we have. I have just spent hours in the ER - Not complaining that I spent HOURS in the ER, But being thankful that I shared those precious hours with someone I could have lost. the children that are sleeping peacefully in their beds- the clothes I am washing -the dishes that I am doing & the dogs that met me at the door when I returned home from this exhausting day. Is this poisonous- oops- Venomous? Anyway - I am now nervous to go outside because he is lurking in my garden. I know it is a Christmas pattern - But all of you have been stitching it and got me hooked - So technically it's your fault - :) !!!!! Have a great week !!!!!!!! 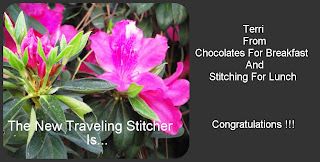 Are You The Next Stitcher For The Traveling Pattern? I will frame this piece to remind me to "Count My Blessings"
like to be part of the Stitcherhood. bring yourself to do this ~ please don't sign up. If you would like a chance to be the next stitcher please leave a comment! 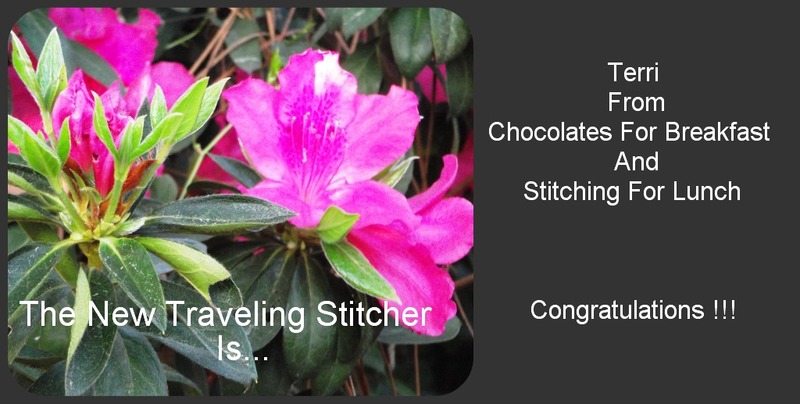 The next stitcher will be chosen on Friday, March 25! I am going to try to finish this as a stitching box - Filled with stitching accessories. Just beautiful don't you think !!! I am truly speechless !!! Have a wonderfully relaxing & stitching filled weekend !!! He has claimed my Martin House !!! New Stash & A Finish !! I am soooo excited because I received my first stash purchase of the year. 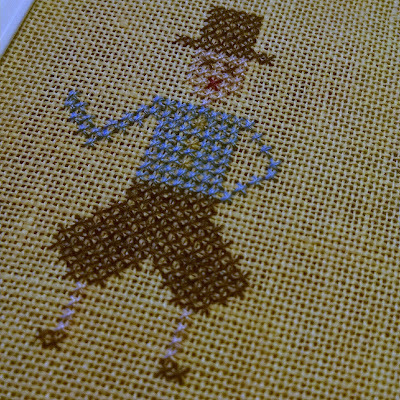 It's the Little House Needleworks pattern "Fresh from the Garden". I also purchased the Exclusive set that goes with it - I just love it !! !